She was a member of the royalty of her time, but like any other woman, she too was concerned about her unborn child that was then in her womb. If all went well, the child would see a world of wealth and power; his would be a fate unparalleled. But first, fate should ensure the safe delivery of a healthy child. The mother hence prayed and promised that her child -- if all was safe and sound -- would one day build a temple. Little did she assume that her prayer would become the prologue of a chronicle that runs till today. Ballal Sen grew up to become the second ruler of the Sen Dynasty of Bengal. But his mother's promise had not been fulfilled until he saw a dream. It was a strange one indeed: a goddess informed him that she lay in a particular area under a 'dhakka' tree. With some of his men, he went to the place, and then to the tree. Beneath the earth, after some digging, came out a statue . An awestruck Sen then built a temple that hosted this statue. He named it Dhakeshwari -- the temple of the goddess of dhakka tree. Our city, Dhaka, was named after this temple, many claim. 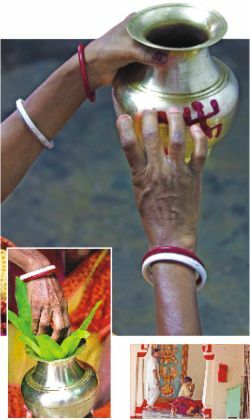 A loosely connected story concerns the use of 'dhak', a type of drum played in temples. During those times, the stage was set very high up, and you could hear the sound of the drums beating from a long distance. It is said that the area of Dhaka extends to the place where the sound of the 'dhak' playing from Dhakeshwari Temple could be heard. Alternatively, many people believe that it's the other way round: Dhakeshwari Temple was named after Dhaka. The temple attracts a huge number of diverse people. Sujata Das is a North Indian who had come to Bangladesh to visit some old relatives. “Every few years or so, we come to Dhaka during the time of Durga Puja festival. And we come to pray in this temple a lot of times, sometimes daily,” she said. The place also attracts many high officials, politicians, foreign dignitaries and diplomats from all over the world. But ironically, Dhakeshwari Temple, being approximately 800 to 900 years old, is inscrutable. Located in Bakshi Bazaar, Old Dhaka, the temple attracts numerous Hindus and non-Hindus not just from our country, but from all across the world. Yet, its establishment date is unknown! Some experts say that the temple could not have been built by the Sen Dynasty -- the architectural style does not reflect the designs of their times. But then again, the temple has seen a lot of renovations and additions. The true architectural structure, sadly, lies under several disguises. In fact, many historians believe that the temple, a few centuries back, underwent a full-scale renovation that has totally wiped out the structure Ballal Sen built. Yet today you are bound to bow in respect to the beautiful architecture of the temple. As you enter the gates, you will see four Shiva Temples -- identical, one after another. Each dome-like structure houses a Shiva linga, a symbol of Lord Shiva. These are basically four separate buildings close to one another in one row. The pinkish domes are of the shape similar to that of inverted cones. “People think that these temples were built by Ballal Sen. Actually they were made by Man Singh -- Akbar's General -- during the Mughal Rule,” Pradip Kumar Chakrabarty, 'Shebait' (Chief Executive) of Dhakeshwari Temple informed. There is yet another Shiva Temple. It was built much later, possibly during British rule. Strangely, this Shiva linga is white, whereas others (and not just in this temple) are black. The main temple houses Goddess Durga. There are five chambers sharing a roof of mighty domes. Being at the centre chamber, she is accompanied by Shiva on one side and Vishnu on the other -- the neighbouring chambers. The row starts with a chamber of Shiva linga and ends with another. Between the chambers are doors -- passageways used by priests in times of prayers. In front of these chambers is an altar built quite recently. With the presence of the divine, the place is one of contemplation and worship, thus having a very spiritual mood. It is quiet other than the chanting of mantras by the priests, the occasional beating of the drum (dhak) and the intense sound of the temple bell rang by visitors. Sitting at the altar, facing the statues, gives a great view, with the glimpse through the decorative arch-doors. Just outside the main altar is an open space, with a couple of small gardens. There is even a pond, surely a great place to sit and ponder or have chitchats after a session of prayers. The walls of the temple are pinkish in colour; the whole place has a light pinkish vibe to it, which also adds to the mood. Architecture, history and spirituality are not all the temple has seen, though. If you think the statue of Durga is the one found by Ballal Sen, you have mistaken. Indeed, the temple has seen bad times. “The temple once owned many acres of land. These were snatched wrongfully, thus making events like Durga Puja difficult to host, given the size of the crowds we get. We urge the government to help get the land back. We also want this temple to become the national temple of Bangladesh, but the government still hasn't agreed to it,” Kumar claims. Kumar has a world of responsibility. His family's story dates back seven generations. Hundreds of years ago, the king of Vawal handed over the responsibility of the temple to his ancestors. The system still exists today, with Pradip Kumar being the seventh-generation guardian. From the tranquillity and beauty Dhakeshwari offers, one hopes that its story extends at least another seven generations. Thanks to Pradip Kumar Chakrabarty, Shebait (Chief Executive), Shree Shree Dhakeshwari National Temple. Goddess Durga is all set to enter our midst for yet another five days of festive celebrations. Durga Puja is here and if you are unaware of how to make the most of the celebrations, here are a few pointers to get you started. 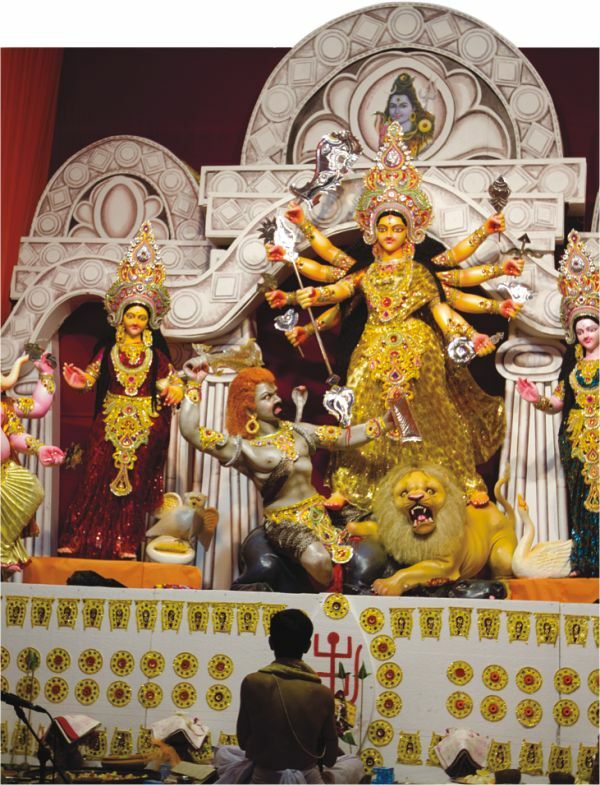 Whether you are a devout Hindu or of another religion, Durga Puja can be enjoyed by all. The festivities are welcoming and worth a visit to take in the grandeur that surrounds the biggest puja of Bengal. The hustle and the bustle start days before the actual festival. The making of the idols is a festival in itself where you can observe the magic of the sculptors who have devoted their lifetime to this very activity. A trip to the hotspots where the idols are being made is hence an enriching activity to undertake prior to the start of the Puja. 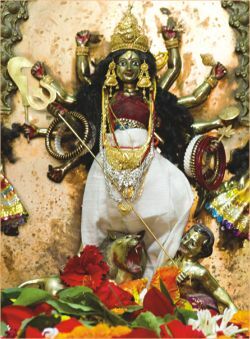 Some of the closest locations to Dhaka where Durga and her children's idols are being moulded are spread across the numerous alleys of old Dhaka. You can also be part of Puja preparations by attending the making of the 'mandap' or the moving of the idols the day before the start of the ceremony. Durga Puja is one of the largest festivals of the country. This of course means that the shopping malls will be pleasantly full and active. Hence pre-puja shopping or even window shopping is a fun activity which should be experienced by all. Go mall hopping on the day before the start of the Puja and stay out as late as the parents (or children) will allow you to. 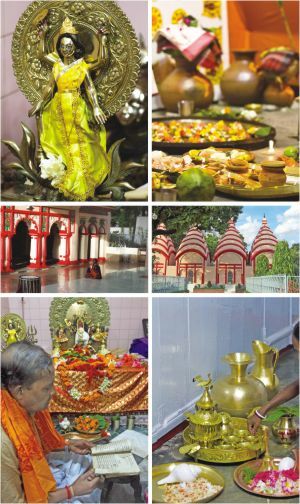 It would also be fun to dress up like a Bengali beauty while doing all the pre-puja activities. Thick, black eye-liner and kohl stretched far past the outer edges of the eyes, red lipstick and a big red 'tip' should do the trick. You cannot be a part of the Durga Puja celebrations and not go pandal hopping. This year, in order to make things a bit more interesting you can add the following 'things to do' while you are pandal hopping. You also must taste the food available at each pandal you visit in order to truly appreciate the uniqueness and dedication which brings this festival to life every year. Have you never wondered why Lord Ganesha has the head of an elephant or why Sharashwati appears on a swan? This year why not immerse yourself in the stories behind the idols and the Gods? If you are an individual who is learned on these stories, spread the knowledge to those who are still unaware and if you are eager for the knowledge, do not hesitate to approach some benevolent looking individual at a Pandal and request to hear the stories which have been told and retold over centuries. Durga Puja is all about celebrating the return of the goddess Durga to her father's land with music, food and happy celebration. This year, why not make the experience a more enjoyable one for yourself and those around you? For their Puja Collection, this year Megh brings a wide range of colours and patterns. Every product bears a signature that screams of innovation and brilliance in the execution of finer details, be it the hand-block print or the embroidery. Buyers can choose from men's panjabi, fatuas, shirts, T-shirts, shalwar kameez, tops and also children's wear. As the outlet of Bangladesh Rural Development Board, Karupalli promises quality products and designs for every occasion. This Puja, Karupalli offers saris, shalwar kameez sets, fatuas, shirts, panjabis, children's attire, ornaments, and household products for home decoration. Contact: Karupalli, Palli Bhaban, 5 Karwan Bazaar. #9124238. Local boutique Bibiana has recently introduced an exciting new line for Durga Puja this year. The collection features three piece shalwar-kameez-dupatta sets, saris, panjabis, fatuas, kurtis as well as jewellery at their Bashundhara Deshidosh, Dhanmondi, Shukrabad, Aziz Supermarket, Banani and Chittagong Deshidosh outlets. The products make extensive use of the colours red, orange, white and black and feature rickshaw motifs and other vibrant designs. Shalwar kameez sets are priced between Tk.1200-4000, panjabis Tk.550-1850, fatuas Tk.600-1200, kurtis Tk.700-1500, saris Tk.750-7500, jewellery Tk.100-900 and shirts Tk.400-650. Rituals of Durga Puja are spread across days beginning with the Mahalaya and culminating to the Dashami, they day when Mother Durga returns to her heavenly abode. Kay Kraft offers a Puja line that comprises a garb for each day of the Puja. Although the primary focus is on panjabis and saris, the entire range does boast a selection of other attires. Be sure to check KK's Puja Collection this season. Available at all Kay Kraft outlets.